Download "CHEM 105 HOUR EXAM III 28-OCT-99. = -163 kj/mole determine H f 0 for Ni(CO) 4 (g) = -260 kj/mole determine H f 0 for Cr(CO) 6 (g)"
1 CHEM 15 HOUR EXAM III 28-OCT-99 NAME (please print) 1. a. given: Ni (s) + 4 CO (g) = Ni(CO) 4 (g) H Rxn = -163 k/mole determine H f for Ni(CO) 4 (g) b. given: Cr (s) + 6 CO (g) = Cr(CO) 6 (g) H Rxn = -26 k/mole determine H f for Cr(CO) 6 (g) c. determine H Rxn for the reaction: Cr (s) + Ni(CO) 4 (g) + 2 CO (g) = Cr(CO) 6 (g) + Ni (s) 2. When 36. grams of water in the solid state at -1..C is mixed with 6. grams of water in the gas state at 15.C, what is the final temperature and state of the mixture? 3. Balance the following equation for a reaction presumed to take place in acidic media: OsO 4 (s) + C 3 H 7 O 2 (liq) = OsO (aq) + CO 2 (g) 4. Balance the following equation for a reaction presumed to take place in alkaline media: [ Sn 4 (OH) 1 ] 2 - (aq) + [ I(OH) 6 ] 1 - (aq) = [ Sn 4 (OH) 18 ] 2 - (aq) + I 2 O (aq) 5. Suppose grams of an organic compound of formula, C 3 H 7 O 2, is combusted in a bomb calorimeter. Suppose further that the calorimeter was determined in advance to have a heat capacity of 12.4 k /. Suppose further yet that before this particular combustion the temperature of the calorimeter was C, and that after the combustion the maximum temperature recorded was 2.13.C. As a final supposition, suppose that the combustion was carried out so that q v is the same as q p. Determine the enthalpy of combustion for this reaction. 6. Determine the enthalpy of formation for the organic compound of formula, C 3 H 7 O 2, that was combusted in a bomb calorimeter in problem 5 above. 7. A compound containing carbon, hydrogen, nitrogen and chlorine is decomposed under conditions of constant temperature and pressure, such that individual volumes of product gases can be measured. When 2 ml of the compound is decomposed, the individual volumes of the gas products are: 1. L carbon dioxide,.9 L water, 3 ml nitrogen, and 2 ml of chlorine. a. Determine the formula of the initial compound. b. Write a balanced chemical equation for the decomposition of the initial compound. Figure 10.3 A mercury manometer. This device is sometimes employed in the laboratory to measure gas pressures near atmospheric pressure. Chapter 5. Name: Class: Date: Multiple Choice Identify the choice that best completes the statement or answers the question. 12.1 How do sub-atomic particles help us to understand the structure of substances? 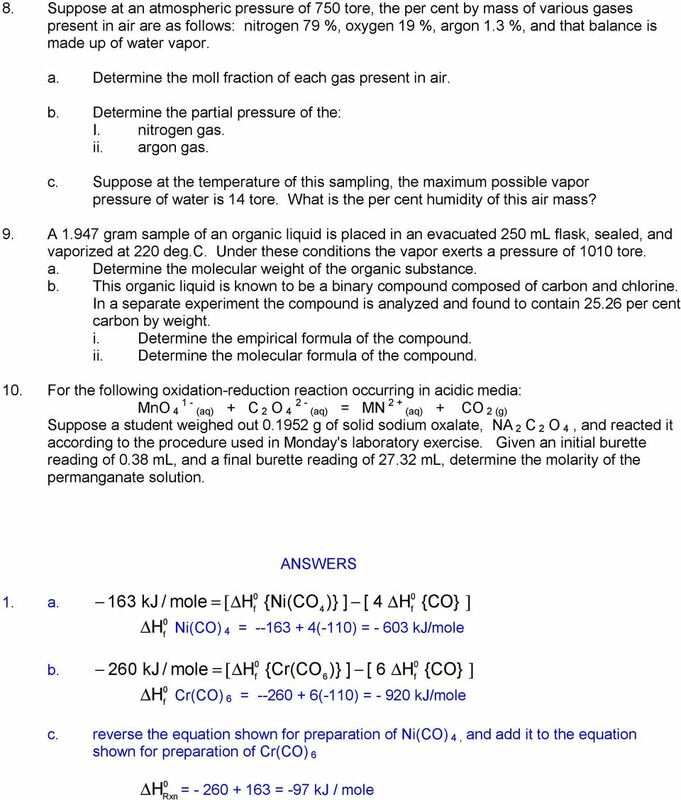 CHEMISTRY 110 Assignment #3 - answers 2011. Chem 105 Fri 10-23-09 1. Thermite reaction 2. Enthalpy of reaction, H 3. Heating/cooling curves and changes in state 4. More thermite thermodynamics 10/23/2009 1 Please PICK UP your graded EXAM in front. Chemical formulae are used as shorthand to indicate how many atoms of one element combine with another element to form a compound. 7. 1.00 atm = 760 torr = 760 mm Hg = 101.325 kpa = 14.70 psi. = 0.446 atm. = 0.993 atm. = 107 kpa 760 torr 1 atm 760 mm Hg = 790. CHEM 1411, chapter 5 exercises 1. A gas-filled balloon with a volume of 12.5 L at 0.90 atm and 21 C is allowed to rise to the stratosphere where the temperature is 5 C and the pressure is 1.0 millibar. Example: orange juice from frozen concentrate. Dilution: a process in which the concentration (molarity) of a solution is lowered. The amount of solute (atoms, moles, grams, etc.) remains the same, but the volume is increased by adding more solvent. 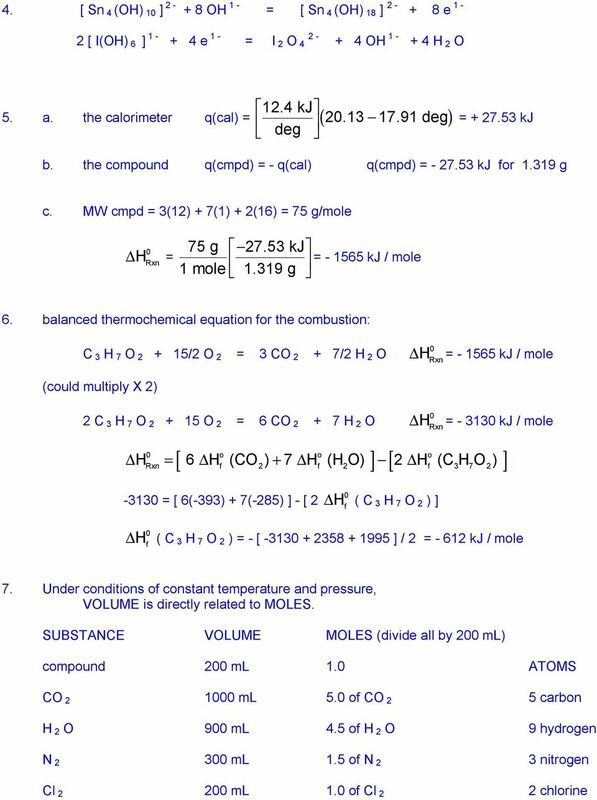 Unit 3 Notepack Chapter 7 Chemical Quantities Qualifier for Test NAME Section 7.1 The Mole: A Measurement of Matter A. What is a mole? 1. Chemistry is a quantitative science. What does this term mean? Chapter 0 Gases. A sample of gas (4.g) initially at 4.00 atm was compressed from 8.00 L to.00 L at constant temperature. After the compression, the gas pressure was atm. (a). 4.00 (b)..00 (c)..00 (d). 1. Balance the following equation. What is the sum of the coefficients of the reactants and products? 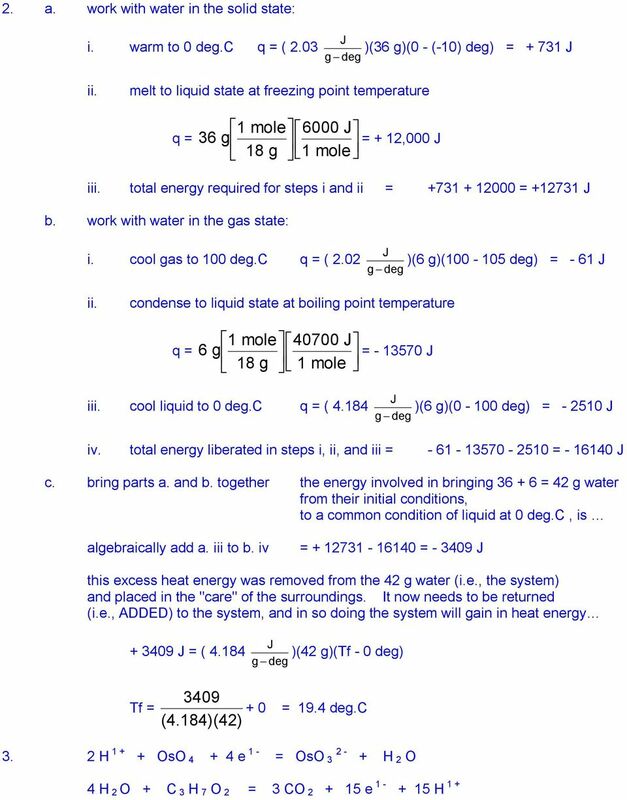 Thermochemical equations allow stoichiometric calculations. Question 1.2: Calculate the mass percent of different elements present in sodium sulphate (Na 2 SO 4 ). REVIEW QUESTIONS Chapter 5. 1. 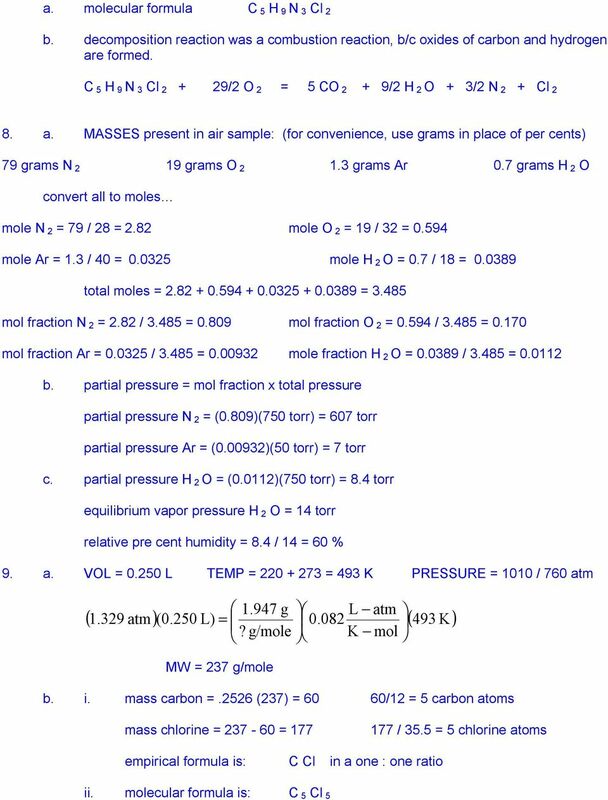 Determine the pressure of the gas (in mmhg) in the diagram below, given atmospheric pressure= 0.975 atm. Iron is. Temperature is a(n) property of a substance. Select two that apply. Which of the following is a chemical change? 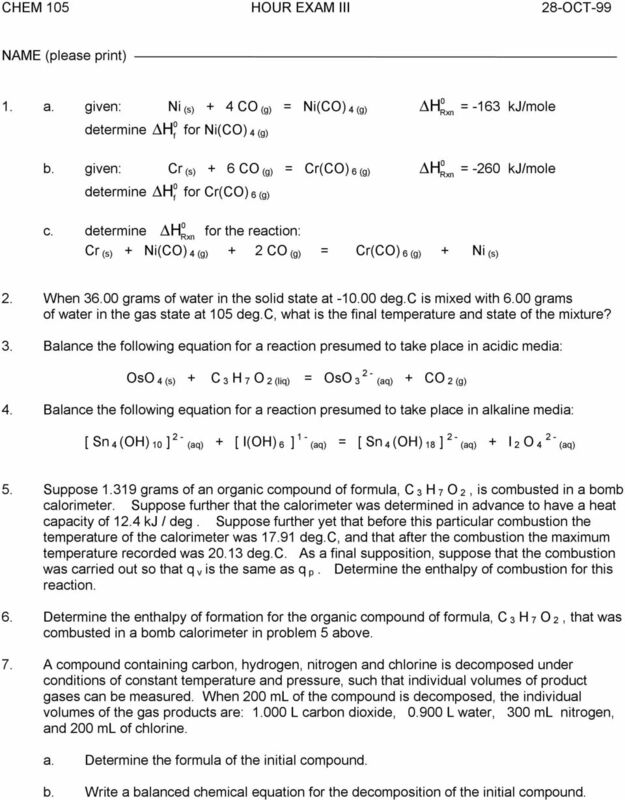 Chem 1A Exam 2 Review Problems 1. At 0.967 atm, the height of mercury in a barometer is 0.735 m. If the mercury were replaced with water, what height of water (in meters) would be supported at this pressure? Thermochemistry Reading: Chapter 5 (omit 5.8) As you read ask yourself What is meant by the terms system and surroundings? How are they related to each other? How does energy get transferred between them? Chapter 1 The Atomic Nature of Matter: Selected Answersc for Practice Exam. The concept of concentration exists to answer the question: How much of the stuff is there? Chapter 10. Can You... 1. draw the Lewis structure for a given covalently bonded molecule? F321 MOLES. Example If 1 atom has a mass of 1.241 x 10-23 g 1 mole of atoms will have a mass of 1.241 x 10-23 g x 6.02 x 10 23 = 7. 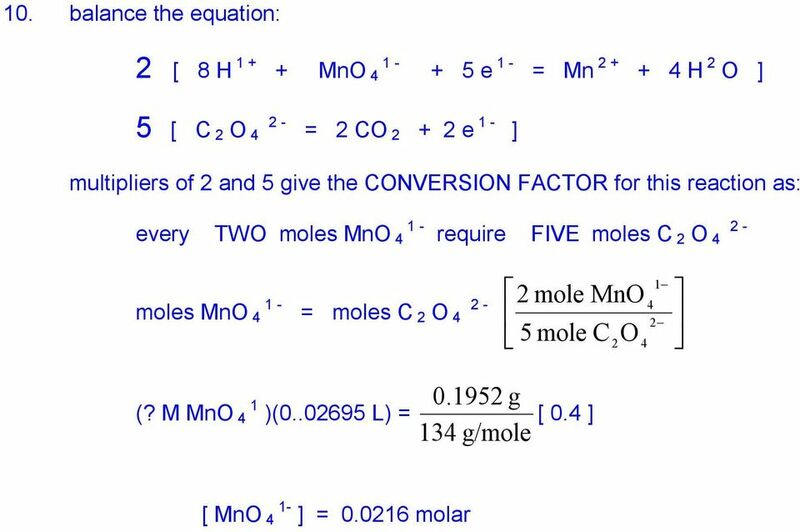 Moles 1 MOLES The mole the standard unit of amount of a substance (mol) the number of particles in a mole is known as Avogadro s constant (N A ) Avogadro s constant has a value of 6.02 x 10 23 mol -1.